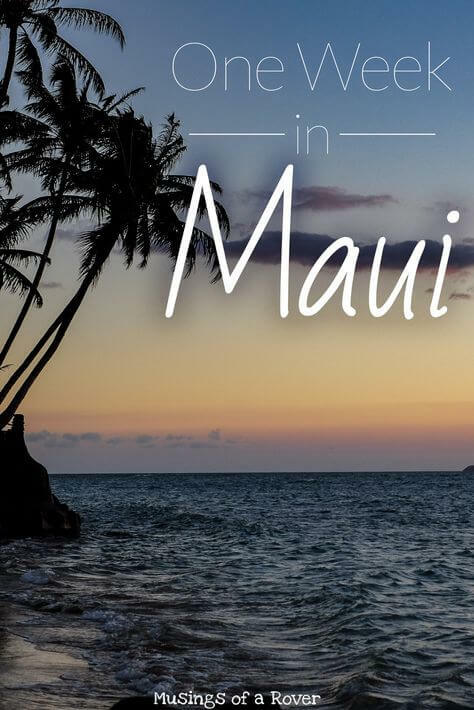 Are you headed to Maui and want to know where you should go? Then you’re in luck. We spent one glorious week on this island’s sores and already I’m itching to go back. Itching to feel the sun on my skin and the ocean beneath my feet. This is our Maui itinerary. Through the course of one week, we discovered what this island has to offer. And hopefully it will inspire you to do the same! Caution! You will not be bored. 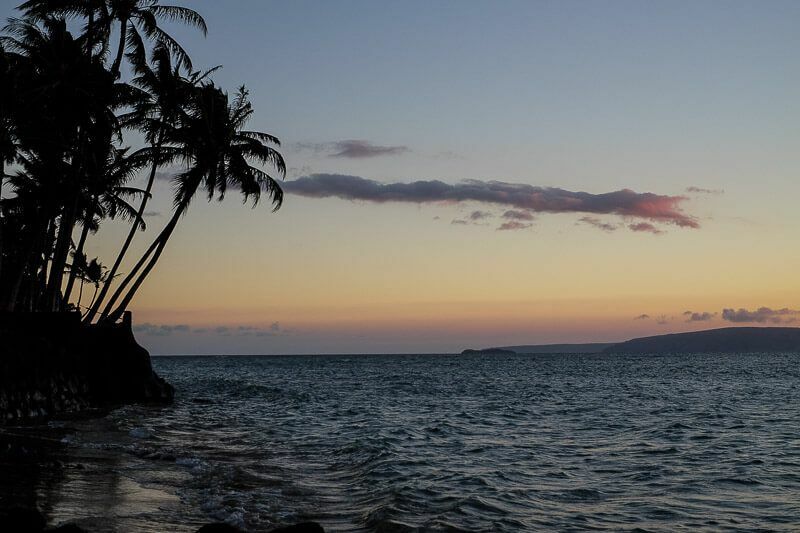 There’s so much to do see and do and discover on Maui. So much that you can’t possibly fit everything into one trip. But that shouldn’t stop you from trying! And if you want to experience what Maui has to offer, you need to see her from all sides, like we tried to do. 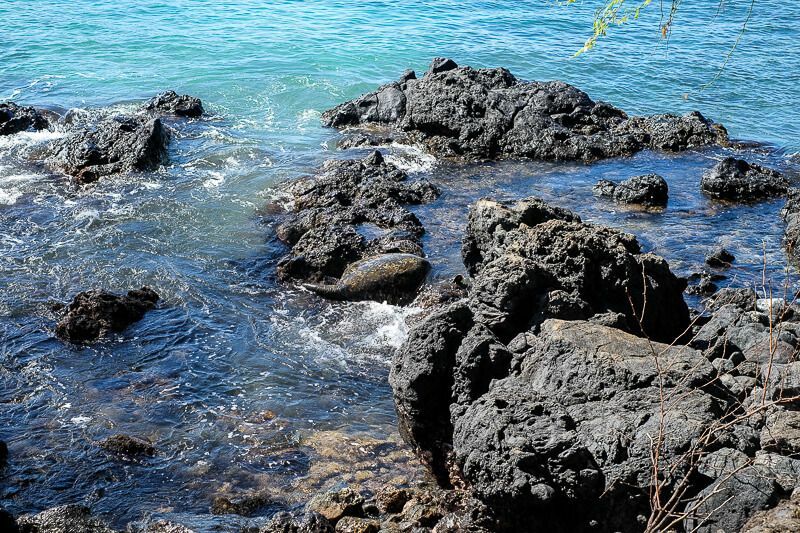 When I think of Maui, I think of…Sea turtles. Golden beaches. Rolling waves. Crazy blue water. Huge volcanoes. Beautiful waterfalls. Mesmerizing black sand beaches. Awesome surfing. Humpback whales. Banyan trees. Coconuts. Pineapple. Sunrises. Sunsets. Hiking. Banana bread. Snorkeling. Bamboo forests. And this itinerary will guide you through it all. But what if you have less than 7 days in Maui? What if you only have 5 or 3? 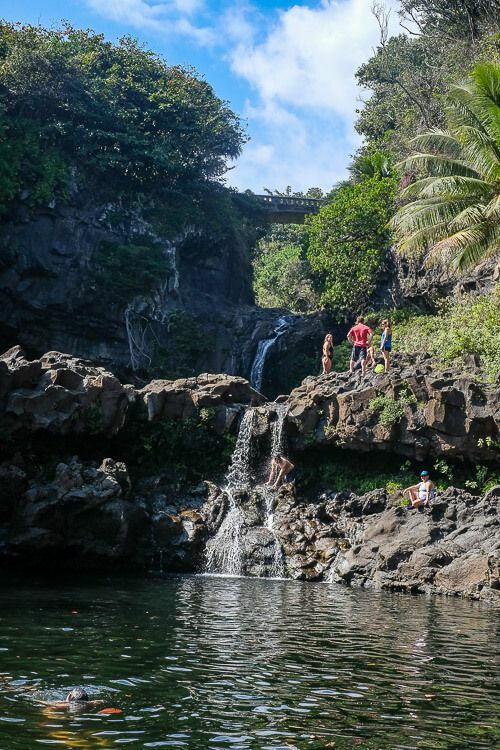 This Maui travel guide will still show you what you can do. And from there allow you to make the choices of what you have to see and what can wait for your next trip. Because trust me, you’ll leave planning your next one. The trips where I’ve been the happiest are the trips where I sleep in the same place more than one night. And so we tried to follow this rule as we travelled around the island. Our first stop? Kihei. Located in South Maui, Kihei is a little built up. But if you don’t want to shell out high prices for a resort, then you may want to base yourself here as well. And in case you were’t aware, most places to stay in Maui are expensive. This isn’t exactly a cheap destination. But you can save money. Avoiding pricey hotels and resorts was our way. So this was our AirBnb in Kihei. This was our first full day in Maui. And it was the day we wanted to snorkel. Actually…that’s a bit of lie. It was the day I had to see a sea turtle. You see, I’m kind of obsessed with sea turtles. And I was not leaving Maui without seeing one. And for many, many people it is a similar goal. So I would consider dedicating your first full day to snorkeling and beach hopping to see if you too can fulfill this dream. Our stops? 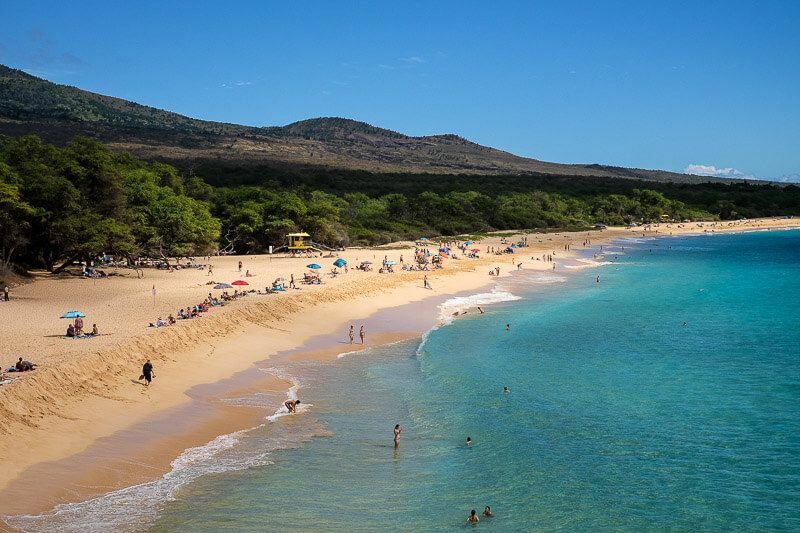 From north to south: Makena Landing, Maluaka Beach (aka Turtle Town), Big Beach, and ‘Ahihi-Kina’u Natural Area Reserve. And we ended up seeing sea turtles at each of those beaches except Turtle Town (which seemed a bit ironic). Do you see the turtle climbing over the rocks in the middle of the photo? The best snorkeling spot though? That has to go to Ahihi-Kina’u Natural Area Reserve. 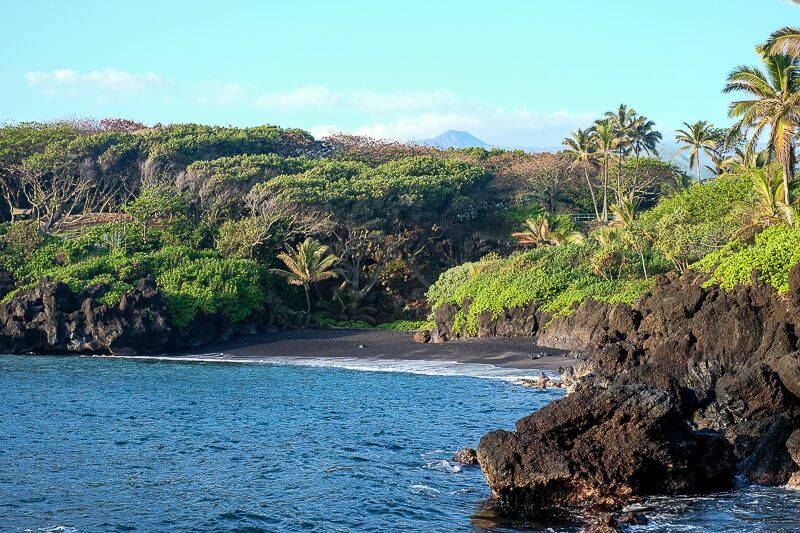 Located at the end of the road and down a rocky path, you might miss this black sand beach. But you guys, no joke, this was the best snorkeling I’ve ever done. The water was so clear it was like an aquarium. And there were so many fish there that I literally felt like I had to swim out of their way. And sea turtles? Oh yea, we saw three here over two separate trips there. Want to read more on my snorkeling adventures? Check out my full length post! This has to go to my first sea turtle sighting. Defeated and lounging on Big Beach, I had just given up on the idea of seeing a sea turtle when I spotted a dark shape moving through the water just out past where the waves were breaking. My breath caught as I watched the shape move. And then, ever so gracefully, a sea turtle head poked above the water and took a breath. There are certain things you have to do when you are in Maui. And for me, surfing was one of them. It was a must do for our Maui itinerary. And I debated long and hard about what company to go with for my surfing lesson. In the end I choose Maui Surfer Girls and I couldn’t have been happier with the choice. We woke up early and headed to Ukumehame Beach for our lesson. The waves were gentle that day, and I stood up on almost every wave. Want to hear more? 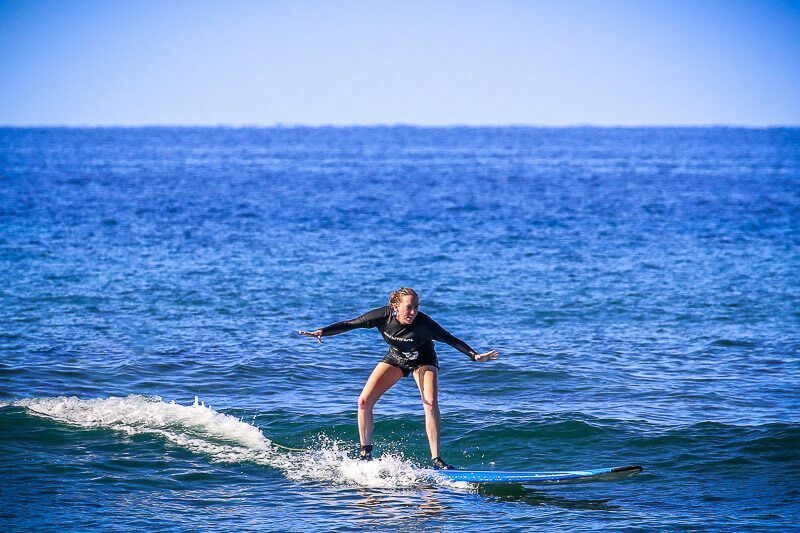 Here’s my post on surfing with Maui Surfer Girls! On our way back to Kihei, we made a quick stop at Papawai Point. The best part about this viewpoint? You can spot humpbacks playing and jumping from the shore. Two even came so close that we could hear the puffs as they took a breath. And the afternoon? Well, it depends what you are in the mood for. Want more beach time? Pick out a spot of sand and relax. But for us, we needed a brief respite from the sun, so we headed into the upcountry to eat some cheese and drink some vodka. You know, just two of my favorite things. That moment when the wave caught me. With shaky hands I leaned back and popped up to my feet in one motion. Easy. Simple. I couldn’t believe it. On my first try, I was surfing in Maui. 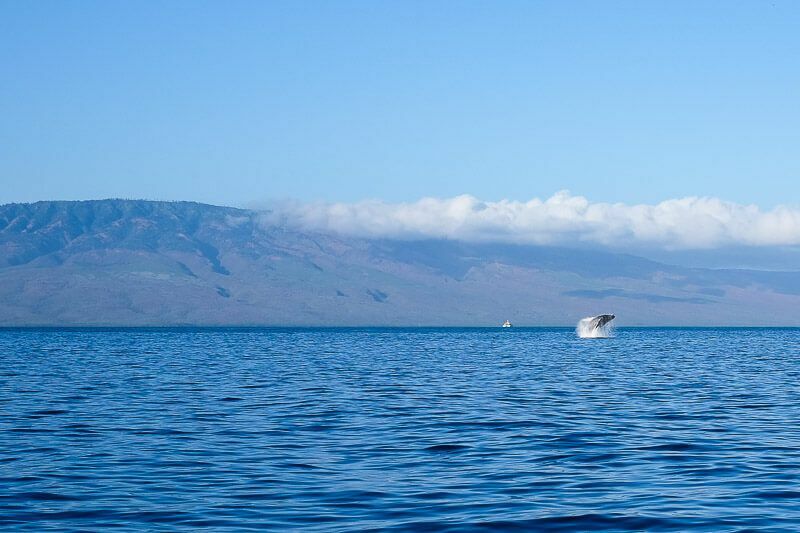 If you decide to visit Maui during the winter, then you must add whale watching to your Maui itinerary. When we found out that February was the peak month, we knew we had to dedicate one whole morning to finding the whales. We booked a tour with Trilogy out of Lahaina and it was the perfect choice. Breakfast, free drinks, a great crew, and, oh yea, the whales. They were spectacular that morning. Want to know how many whales we saw? Read my whale watching post for all the details! After our tour was over, we spent the afternoon exploring Lahaina. Make sure to stop in the Old Lahaina Courthouse to see the museum and art gallery, and don’t forget about Banyan Tree Square. 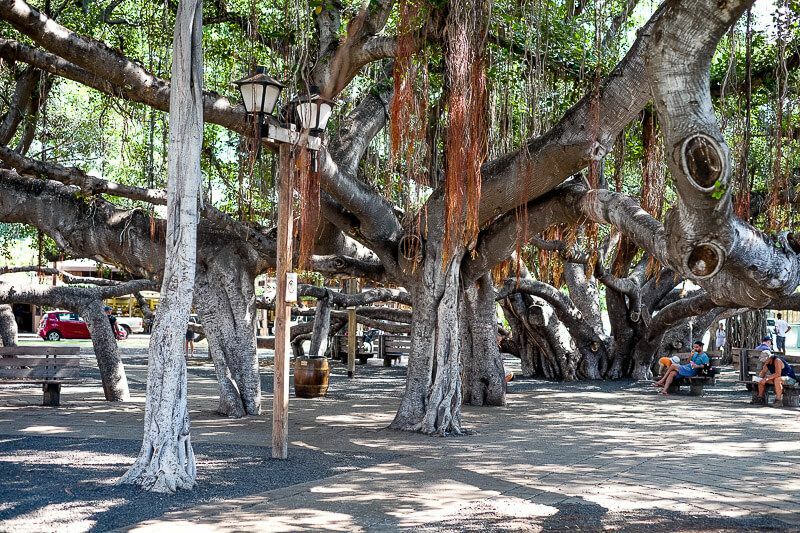 This tree definitely deserves a spot on your Maui itinerary. It’s over 100 years old, is the largest in the United States, and has 16 trunks. Think about that. 16 trunks! I didn’t quite understand what that meant until I saw it. We finished the evening with an awesome sunset. Our favorite spot? Keawakapu Beach. Would we see any whales? I wasn’t sure. With nervous eyes, I searched the horizon, looking for the any sign of the humpbacks. And then, not even 15 minutes into the tour, a whale leaped into the air 200 yards in front of us. Kihei Caffe has a line out the door for a reason. Don’t miss it. 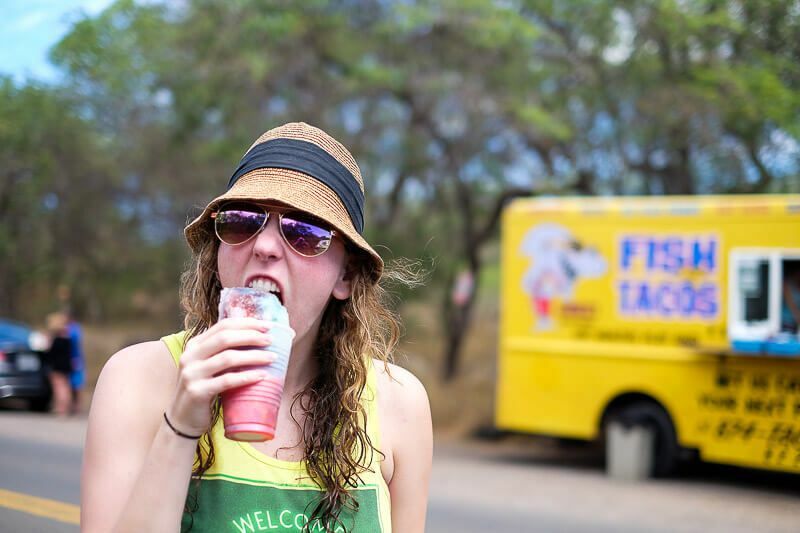 Jawz Fish Tacos is a food truck located on the main road south of Turtle Town. There may also be a truck at Big Beach as well. The tacos were just okay. But since it’s the only food you can find this far south, it was like beacon of light as we saw it in the distance. We had just run out of water and I was dreading the 20 minute drive back north to the closest gas station. Jawz saved us that day. Huge bottles of water. Fish tacos. And rainbow shave ice. 808 Deli looks like just your normal deli/sub spot. But definitely don’t let its unassuming nature deter you. This is one good lunch spot. Da Kitchen Express is a low key, Hawaiian eatery located in a strip mall in Kihei. This wasn’t our favorite meal, but it was a good, inexpensive option I would still recommend. Cafe O’Lei is located above a strip mall. It’s a great seafood spot, if a little expensive. This was definitely the fanciest place we ate all week. Prices were high, but the food was good. Amigo’s was our last dinner in Kihei. We wanted something inexpensive and delicious. And $8 burrito Tuesday sounded marvelous. After Kihei we wanted to see the other side of Maui. 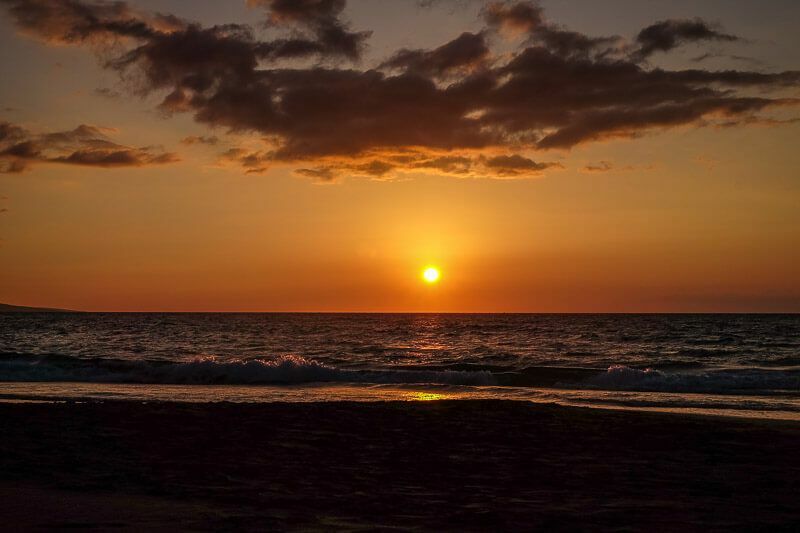 To make the most of your trip to Maui, definitely spend some time in the south and the north. It’ll give you a good idea of what the island is like as a whole. 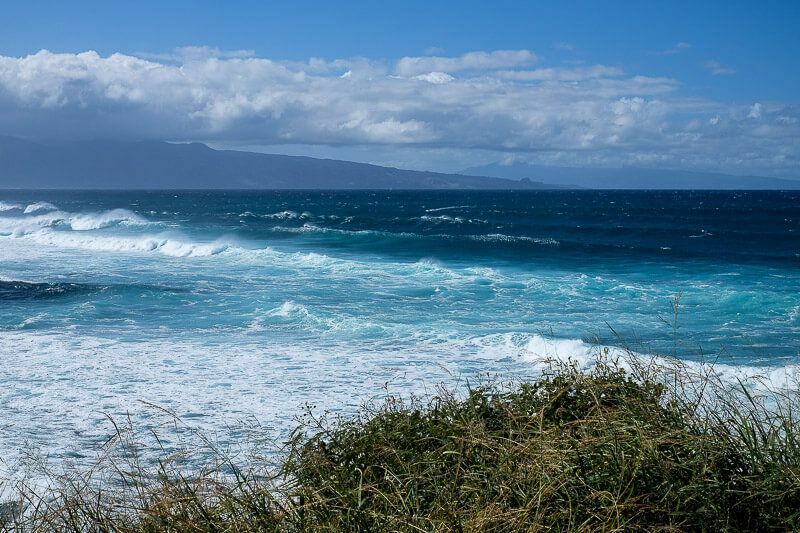 Plus some of the best things to do in Maui can be found around Paia. I hate itineraries that are too rigid. And so this is a free day. What do you want to do? Need more beach time? Pick a spot of sand, lean back, and enjoy. 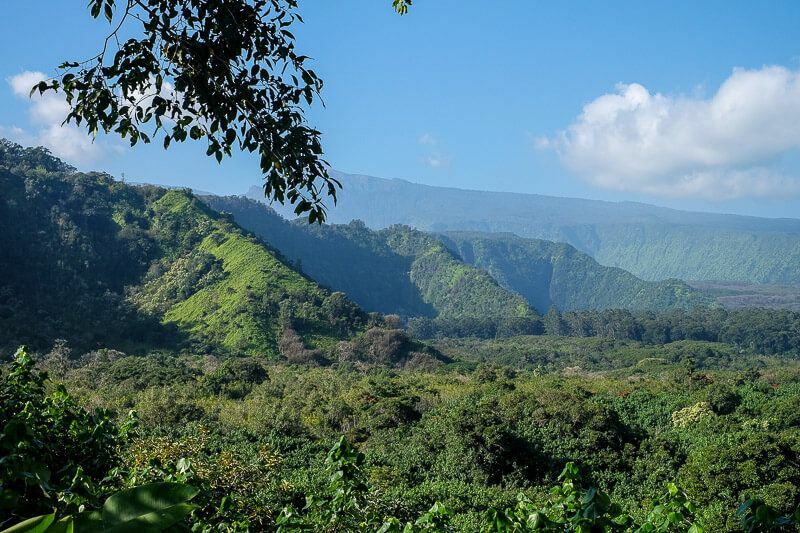 Haven’t seen Maui’s upcountry yet? Consider a driving tour to its various farms. Need more surf time? Rent a board and hit the waves. 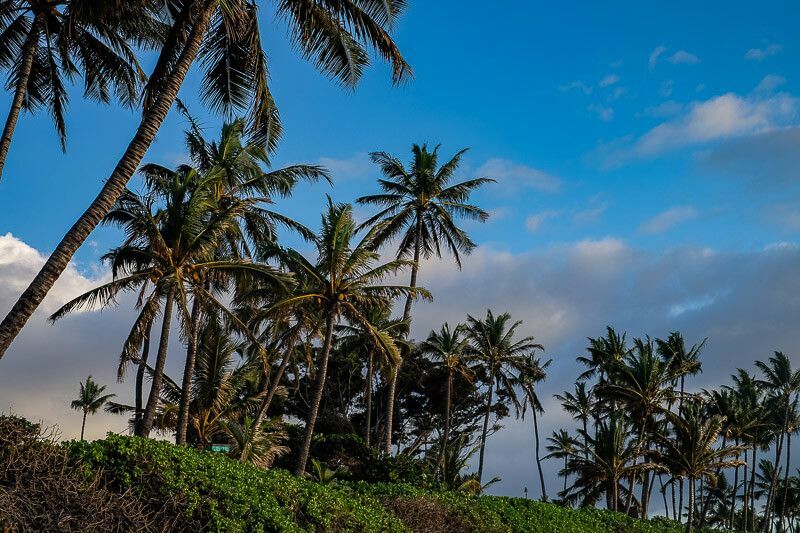 Want to spend more time in Paia? Head out of Kihei early and explore this cute little town. But what did we do? Well, when we woke up on that Wednesday, our Maui itinerary was wide open. Our only plan for the day was to leave Kihei and check into our new AirBnb in Paia. 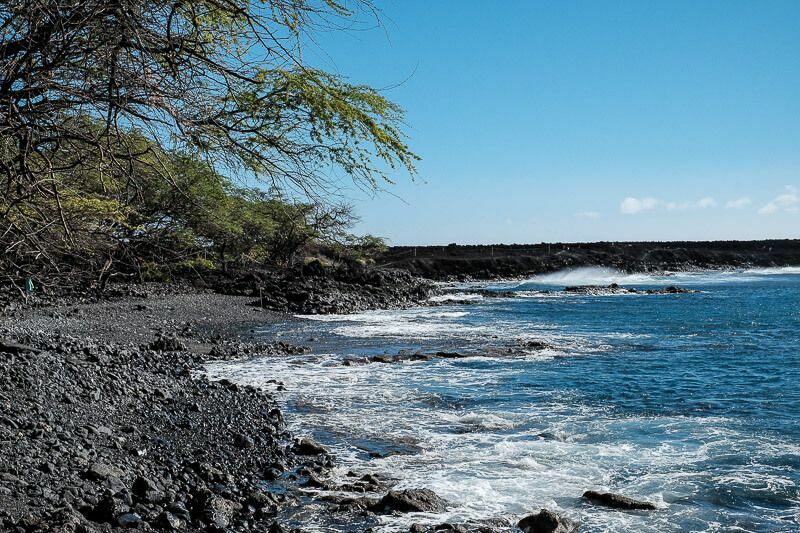 But before leaving South Maui, we decided to hit up our favorite snorkeling spots again – Makena Landing and Ahihi-Kina’u Natural Area Reserve. And yes – we did see more turtles. That afternoon we headed north. Our first stop was to Ho’okipa Beach. We pulled over at the lookout on the eastern side to watch the waves. And the waves were HUGE that day. Some of the biggest I’ve ever seen in person, they pounded at the beach and rocks. And the blue. That was the most startling. The water was so blue it looked fake. After taking in the beauty of Ho’okipa Beach, we hit up one of the top spots on the Road to Hana – the Bamboo Forest Trail. 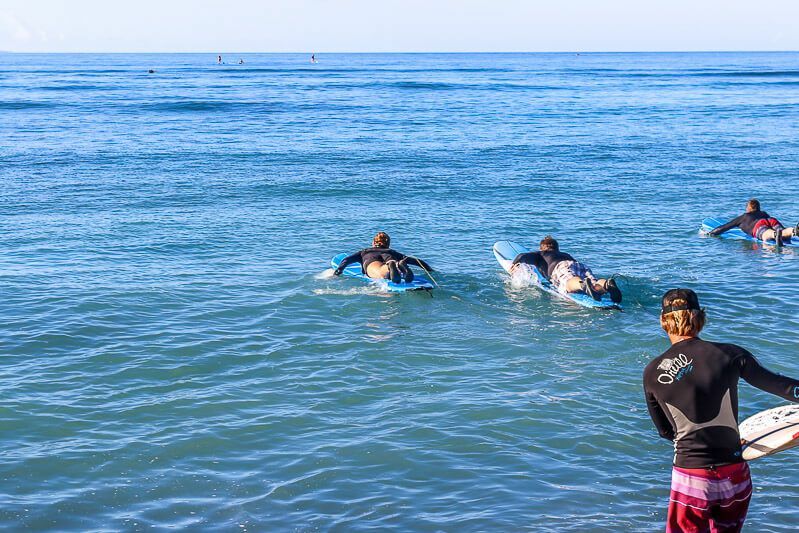 Without a doubt, this is one of the most fun things do in in Maui and so a must for our Maui travel guide. But since this trail is long-ish, we decided to go ahead and tackle it that afternoon. And though we didn’t make it to the end of the trail, we did see two of its four waterfalls (with the second one all to ourselves). There’s something special about having your own private waterfall. I was muddy all over. Knees, shins, hands, fingernails, elbows, forehead, etc. Scrambling up that muddy bank (not trusting the “rope” that hung there for support) was rough. But then, through the bamboo on the side of the trail, I saw it. The second waterfall. Want to know more about the Bamboo Forest Trail? 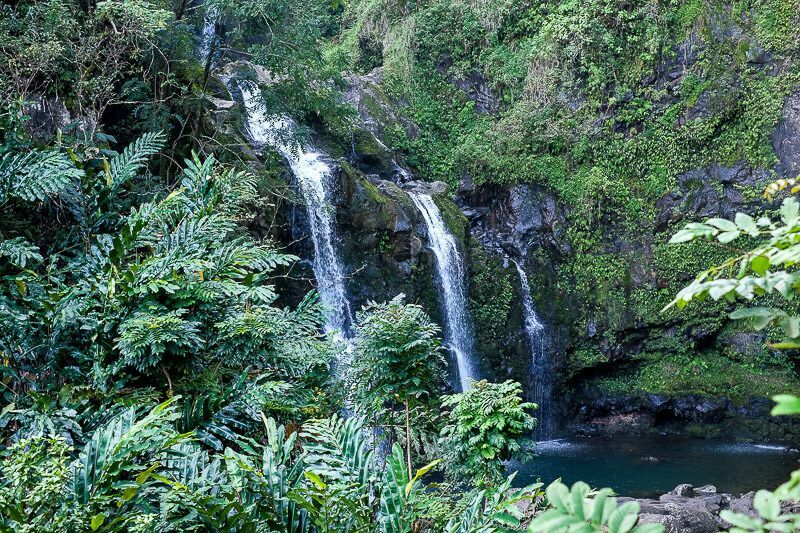 Check out my Road to Hana Itinerary. Haleakalā. It stood over us for the first four days of our trip. Beckoning to us. Calling to us. And finally, on the fifth morning, its day had come. Most people come to the mountain to watch the sunrise or the sunset. But there’s so much more to this place. 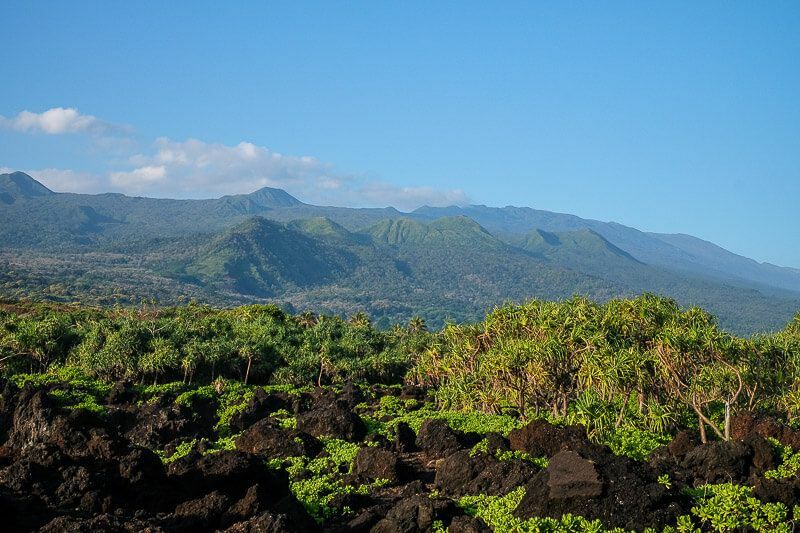 First off, a stop at each of its magnificent viewpoints was a must for our Maui itinerary. Leleiwi Overlook, Kalahaku Overlook, the Visitor Center, and Pu’u’ula’ula Overlook were the ones we loved the most. 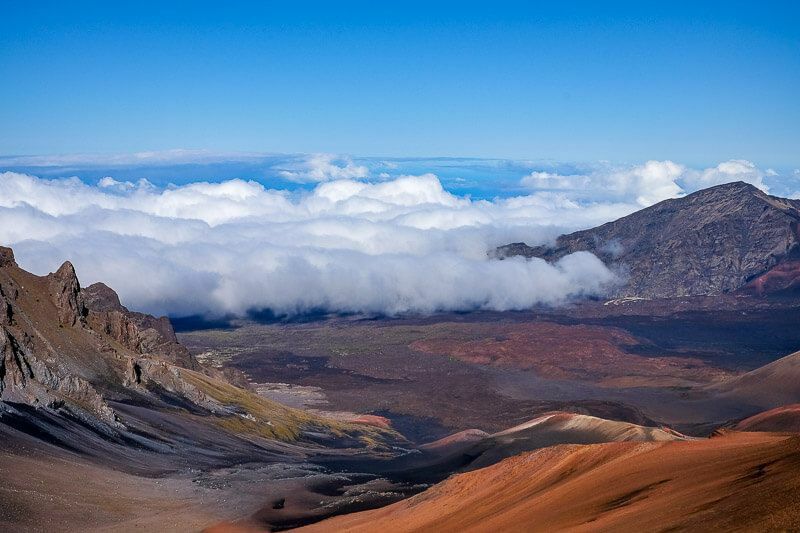 But if you want to really see Haleakala, to get to know this mountain, then a descent into its belly is required. We walked 2 ½ miles down the Sliding Sands trail towards the crater bottom. And to say the landscape looked alien, wouldn’t quite do it justice. Yes, it did look out of this world. But it was also beautiful. Reds, browns, yellows, greens, and blacks all swirled together. 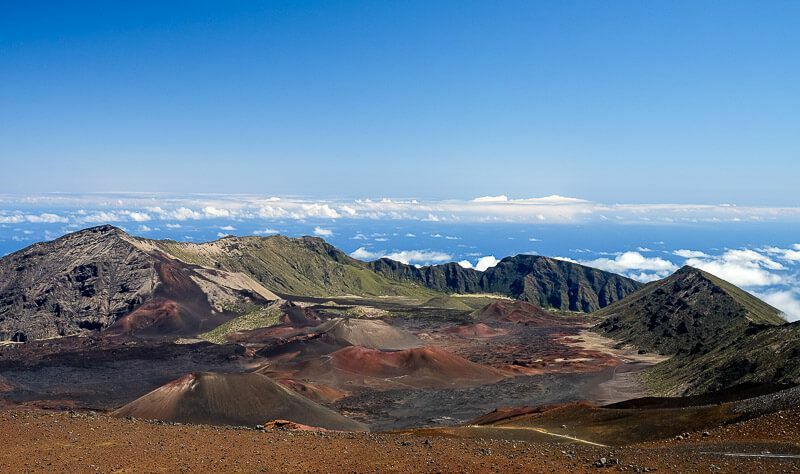 Haleakala definitely deserves at least a day of your Maui itinerary. 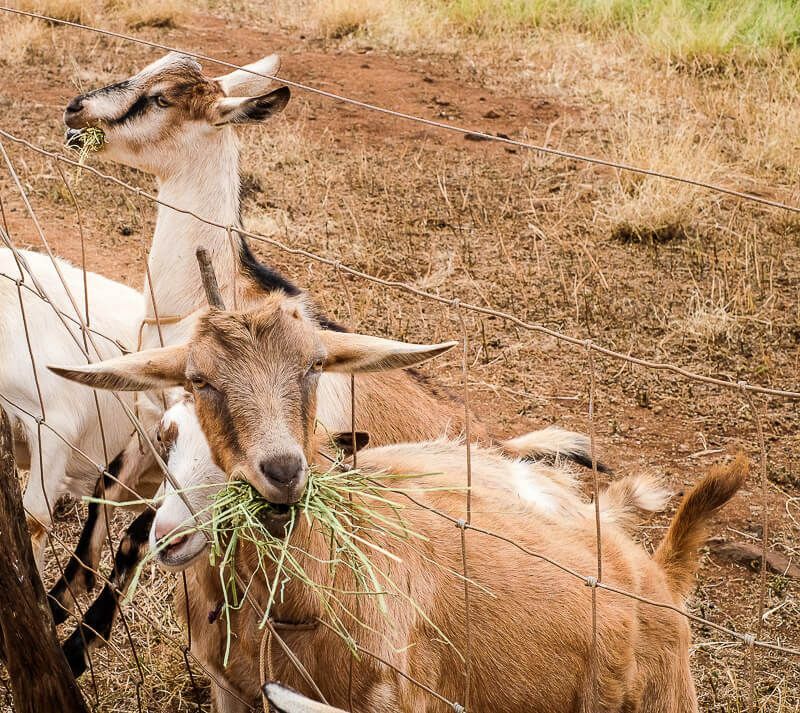 For many it is one of the the top things to do in Maui. 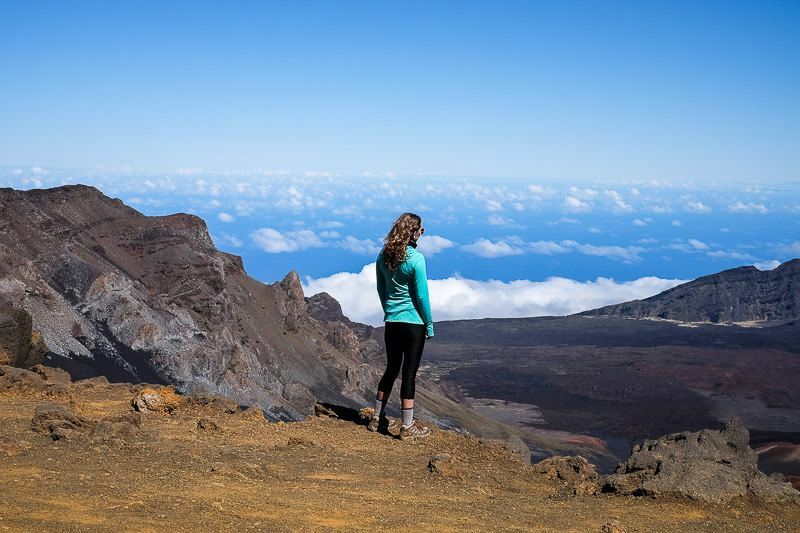 Thinking about tackling Haleakala’s trails? Read my post on what the Sliding Sands trail is like. It was cold. And windy. And walking up the slope to the building at the top of the Pu’u’ula’ula Overlook was harder than it should have been. But then my feet slowed as the entire crater came into view. It was magnificent. La Provence is located more in the upcountry than in Paia. But if you are headed for Haleakala and have a hankering for some of the best pastries I’ve ever had, consider a quick stop here. 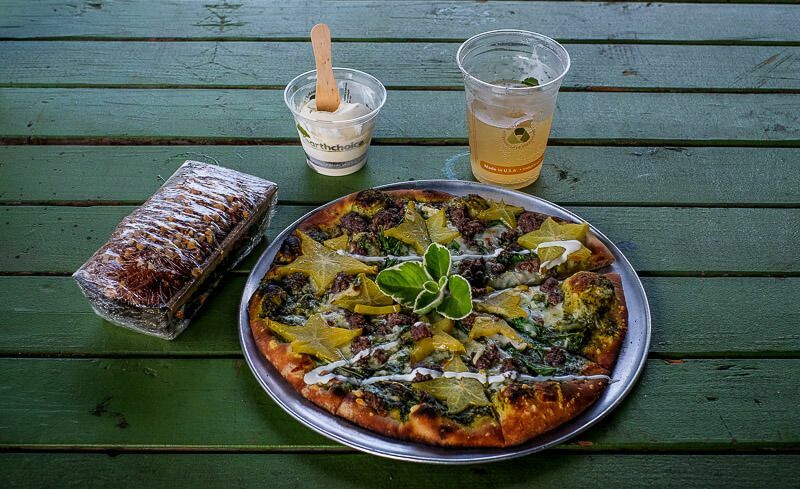 Baked on Maui is right outside of Paia on your way to the Road to Hana. We made sure to grab a quick breakfast here, as well as packing away some sandwiches for lunch later. Paia Fish Market looked low key. A line snaked out the door when we arrived. And we had to fight for two spots at the 8 picnic tables that lined the walls. But with one bite, I was hooked. The simple Fish and Chips were fantastic – probably the best thing I ate all week. Cafe Mambo is colorful and eclectic. We were pulled in by the open windows and the fragrances wafting out of them. And my crispy duck burger? Fantastic. 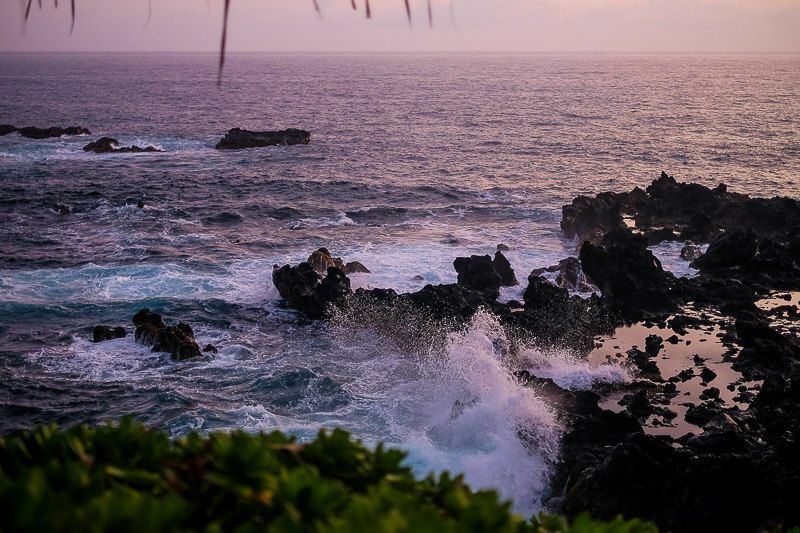 If you’re ready for the drive of your life then you know its time to take on the Road to Hana. Most people come just for a day trip, but that’s no where near enough time. Even our two days were busy and hurried. You definitely want to make this a part of your Maui travel plans. The Road to Hana. This is the other side of Maui. Its wilder side. Tight turns, steep cliffs, pounding waterfalls, and black sand beaches are just some of the things you’ll see here. Most people dedicate an entire day to it, but that’s not nearly enough time. We explored its curves, nooks, and crannies over two days, and even then we had to pass on certain sights. Not sure what to stop? Check out my Road to Hana Guide! But the one Road to Hana sight that was at the top of our Maui itinerary? The Kipahulu area of Haleakala National Park. 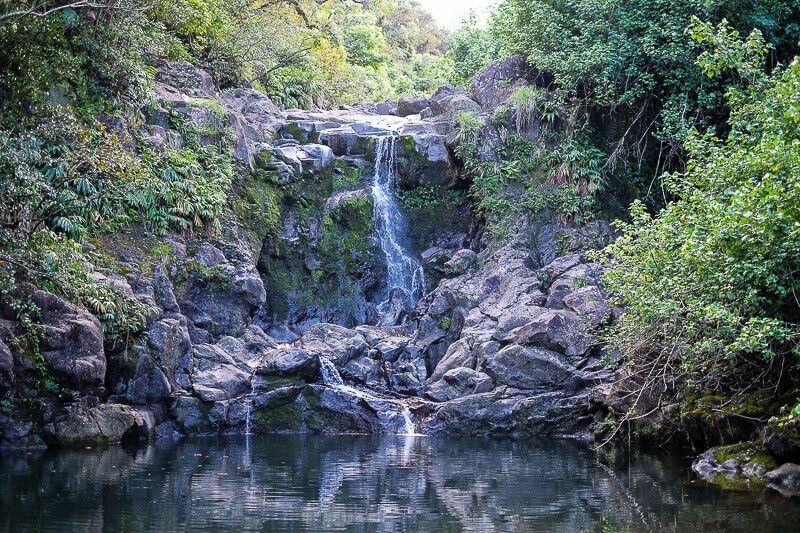 Because it’s here, located at the end of a 2 mile trail, where you can find Maui’s tallest waterfall: Waimoku Falls. The hike was hot and sticky and muggy. But after making the 4 mile roundtrip hike, we were able to cool off in one of the lower trail’s freshwater pool. Our day ended at Waianapanapa State Park. 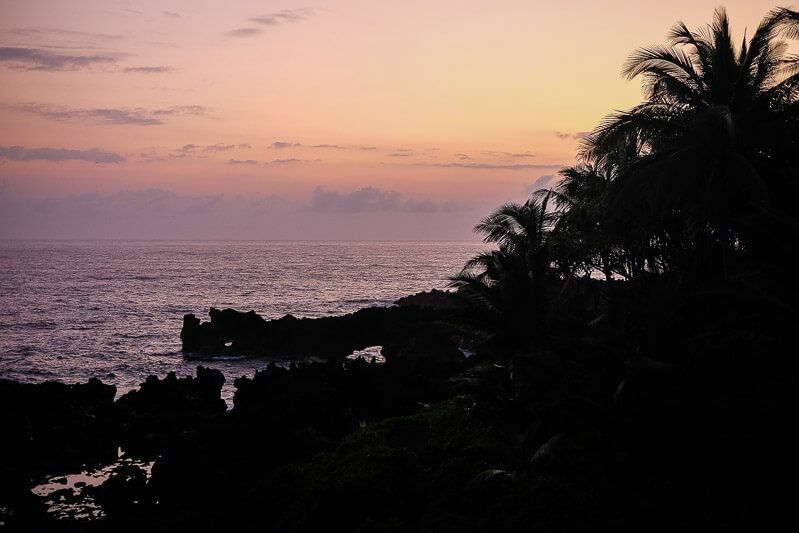 Spending a night (or two), is definitely necessary if you want the real Road to Hana experience. But since hotel prices can be high, we decided to camp at Waianapanapa. Having its perfect black sand beach to ourselves was definitely worth sleeping on the hard ground. Sweat poured down my face, and I tried to smear it away. Luckily I wasn’t that tired, but the humidity…it was killer. When would we reach the waterfall? A man 15 minutes back had said it was only 5 minutes further. And then, I heard it. Not a thunderous roar, but a gentle, steady one. Looking up and up, I finally spotted the top of the waterfall through the trees above me. We had made it. Our last day in Maui. Waking up for the sunrise in Waianapanapa was tiring but worth it. Pink and orange bathed the ocean around us in a soft glow. Interested in camping on Maui? Find out how it went for us! We explored the state park a little bit more, but we knew we had to hit the road soon. Our time was running out. Our flight was leaving that afternoon. On the way back to the airport, we made sure to stop at all of the Road to Hana spots we had missed the day before. My favorites that morning? Wailua Valley State Wayside and Three Bear Falls. It was time to turn back. Ryan was already disappearing among the rocks. But I wanted to stay, to linger here a moment longer. The ocean at my back, rolling green hills at my front, and me standing among lava rocks. It was quiet. So quiet. Mesmerizing. Ke’anae Landing Fruit Stand (aka Aunt Sandy’s Banana Bread) had the best banana bread I’ve ever head. Hands down. Hana Farms Clay Oven Pizza is only open Friday and Saturday. And it is the spot to go to on these nights. The pizza is marvelous too. Ours featured starfruit and prosciutto. 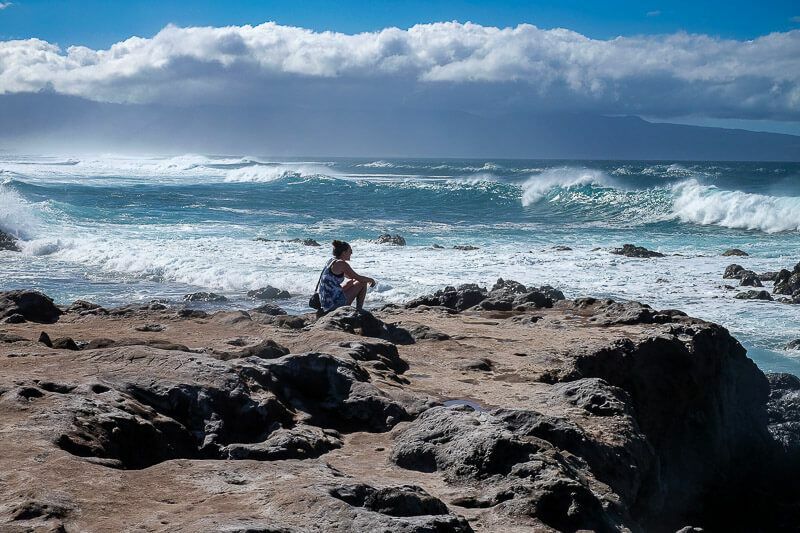 Our 7 days in Maui was amazing and breathtaking, but they were not nearly enough. There’s so much more I want to do and see. I want to see the surfers in Honolua Bay. I want to camp inside of Haleakala’s crater. I want to drive the backside of the Road to Hana. But Maui was more than just a list of things to do and see. There was also a feeling we had when we were there. The people. The land. The ocean. It just felt right. There are places that call to you. Places that always seem to be right behind you, tapping on your shoulder the moment they think you might forget them. There are only a few places in the world that have that kind of pull over me. Ireland is one. It feels like home. But could Maui be another? Perhaps. Maybe I just need to go back and see. Is a week in Maui ever enough? My sister and I spent 2 full weeks exploring Maui. My favorite activity had to be an impromptu hike through the rain forest. We ate fresh avocado and strawberry guavas for lunch and played in the fresh river, jumping from one mossy rock to another. We had to duck under a lot of “Don’t go off trail” signs in order to find the sweet spots, but I think the idea of losing our way made it much more fun! Nice! I loved doing the Bamboo Forest Trail. It was epic and, since it was the end of the day, we got the 2nd waterfall all to ourselves. Though I’m jealous of the strawberry guavas. I didn’t try any while I was there. That sounds amazing! 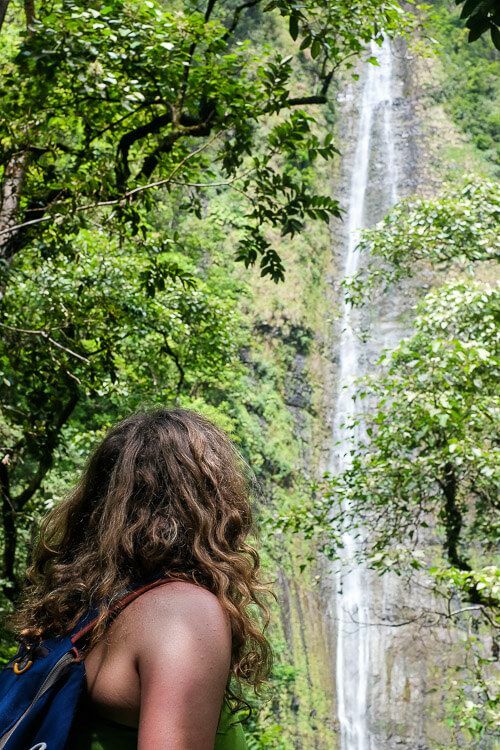 That slippery hike to the secluded hana waterfall is tough to beat! awesome article. Getting married in September and we will be going for our honeymoon. I know we will have a rental car. Maybe I can show this to him and he will agree to have a few day trips. Congratulations!! I hope you have a wonderful time! Getting in the car and exploring Maui was one of my favorite things to do.